The EL25 is capable of accepting up to 2,000 totally flexible codes, making the EL25 ideal for virtually any installation. Unlike other systems, the EL25 may be purchased as a base unit or can be ordered with optional plug-in modules. Answer a call from the door or gate while in the middle of another outside call with Call Waiting. 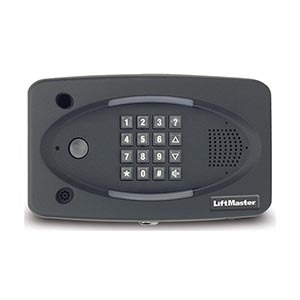 Easily enter your PIN with the recessed, lighted and ADA-compliant keypad. Automatically dials the residence when a vehicle approaches the property with auto-sensor input. Provides a unique double-ring on the system’s main telephone line to distinguish between a standard phone call and a visitor request call. Program up to 16 separate holidays with defined override commands. Customize access in up to 62 time zones with three segments each. Stores a minimum of 8,000 transactions including date, time, ID and transaction type. Generates activity reports and allows printing of the database. Programs up to four assignable relays. Mounts on the back plate for easy wiring and installation. Versa XS is our menu driven software configuration and database management tool for EL25 Telephone Entry Systems. Prevents pass back of cards and codes for a pre-programmed amount of time to better secure who is entering the property.